The eddy covariance tower at Coweeta continuously measures the concentration of gases in the air. USFS photo. Soil is bursting with invertebrate life, microbial life, and living plant roots. It’s also where decomposers do their work. All of this activity requires oxygen and releases carbon dioxide. Soil respiration is part of a giant puzzle – the carbon cycle. Respiration has a flipside: carbon uptake. Trees pull carbon dioxide out of the atmosphere and use it for growth. Oishi recently led a study on carbon gain and water loss in a deciduous hardwood forest. The study was published in the journal Agricultural and Forest Meteorology. 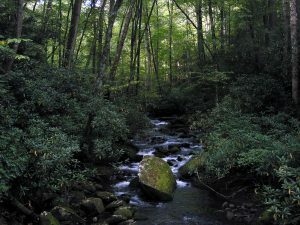 The scientists used several sources of data, including eight decades of local climate records collected at the SRS Coweeta Hydrologic Laboratory in western North Carolina. Temperature has been recorded at Coweeta since 1934. Since the 1980s, temperatures have risen by about half a degree C every decade. 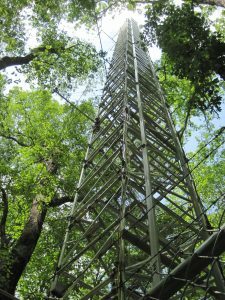 An eddy covariance tower also provided critical data for the five-year study period (2011-2015). The tower was installed in 2010. Ten times a second, it records the concentration of carbon dioxide and other gases. Previous studies at Coweeta developed a methodology for analyzing the eddy covariance data – which Oishi and his colleagues used in this study. 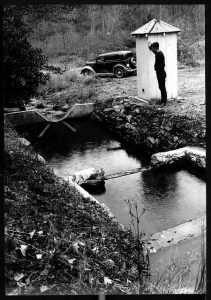 Temperature at Coweeta has been recorded since the 1930s. Since the 1980s, temperatures have risen by about half a degree C every decade. USFS photo. The math is complicated, and complicated further because of the mountainous terrain. But eventually, the data reveal the net exchange of carbon dioxide between the ecosystem and the atmosphere. Throughout the study, the forest was a net carbon sink, meaning that it removed more carbon dioxide from the air than it released. Carbon uptake was much lower in warm years – about 40 percent lower than in cooler years. Warm years also released more carbon through respiration. Respiration was 10 percent higher in warmer years. Warm spring temperatures also provide prime growing conditions for rhododendron. Rhododendron is an evergreen shrub that is very common in the study area understory, and is expanding in many southern Appalachian forests. Mature trees typically control overall forest water use, but rhododendron can transpire year-round, inhibits recruitment of canopy trees, and could lower total forest productivity and canopy evapotranspiration. Evapotranspiration was relatively stable, even though some years saw higher than average precipitation – 2013 was the wettest year on record. Coweeta is located in one of the wettest biomes in the U.S. In addition, the tower is located in a cove, which help to maintain moderately-high soil water availability, compared to upslope stands. Rhododendron’s dense thickets can affect forest productivity, canopy evapotranspiration, and tree recruitment. USFS photo. “Trees in our study had plenty of water and transpired near their potential for the majority of the growing season,” says Oishi. Unused water evaporates or flows into streams. As precipitation becomes increasingly variable, water yield from southern Appalachian forests could fluctuate. The net effects of warming are uncertain and highly dependent on local climate and vegetation. In the southern Appalachians, however, longer growing seasons may be too warm for plants to store extra carbon. For more information, email Chris Oishi at acoishi@fs.fed.us.